​​Malaysian ​Borneo - home to amazing wildlife, stunning scenery, indigenous tribes and tranquil islands surrounded by clear seas teeming with life - this is a slice of paradise on earth that really has it all! ​Malaysian Borneo is divided into two regions - Sarawak and Sabah. Both can be easily accessed from the main hubs of Kuala Lumpur and Singapore, while an extensive regional airline network enables you to easily explore the likes of Kota Kinabalu, Sepilok Orangutan Sanctuary, the renowned snorkelling and diving of Sipadan, the bat swarms of Miri and the headhunter villages in the remote rainforests of Sarawak. Malaysian Borneo is an easy region to visit with a wide range of accommodation levels, good to excellent amenities and reliable public transport. The majority of people speak some English. ​Malaysian Borneo experiences year-round temperatures averaging between 27 °– 32°C. Although there is generally a peak in rainfall from November through March, rain is often localised and sparodic and should not make any bearing on your decision as to when to visit. 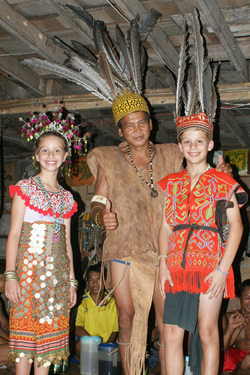 We visited Malaysian Borneo in 2014 when our children were aged 10 and 13. Seeing orangutans in the wild was definitely a highlight for us on this trip.